Bicester in Oxfordshire has been chosen as the site for the coalition's second new garden city, the government has confirmed. Up to 13,000 new homes are due to be built on the edge of the town, as part of the coalition's plans to help deal with the UK's housing shortage. 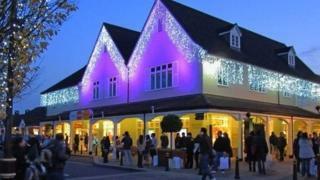 "I can confirm the government is putting its support behind Bicester," a Treasury spokesperson told the BBC. The measure was announced as part of a National Infrastructure Plan. "New houses support economic growth and are a crucial element of a fair society, so I've prioritised the investment of almost £2bn to ensure we can build on average 55,000 new homes a year until 2020," the chief secretary to the Treasury, Danny Alexander, said on Tuesday. "Combined with the other measures we are announcing today, we will vastly increase supply by providing funding certainty, unlocking capacity in housing associations and kick starting stalled regeneration projects." Mr Alexander added a government agency could plan, build and sell tens of thousands of homes on public sector land. He suggested that building projects of this nature could go some way to supplying the 250,000 houses that need to be built every year to meet the current housing shortfall, rather than selling land to private sector house builders who did nothing with the land. He added: "The message to the house building sector would be simple: if you don't build them, we will." A pilot project is already under way at Northstowe, a former RAF base in Cambridgeshire, with the capacity for 10,000 houses, That would make it the largest planned town since Milton Keynes. Bicester is expected to get a new railway station to serve the expanded population as part of rail plans previously detailed by Deputy Prime Minister Nick Clegg. Earlier this year, the government announced that Ebbsfleet in Kent had been picked to become the first modern garden city, with an initial 15,000 homes. The government ultimately plans to build three garden cities, each with more than 15,000 homes. Media captionHelen Marshall, Campaign to Protect Rural England: "You have to feel a bit sorry for locals"
In March, it said funding from an existing £2.4bn pot would be made available for developments being built up to 2020. Garden cities are large-scale developments in which, according to the government, certain features can be "hardwired into designs from the beginning". The government has said it does not want to "impose any definition of what garden cities are", but features can include "quality design, gardens, accessible green space near homes, access to employment, and local amenities". But the Campaign for the Protection of Rural England (CPRE) said there are "mixed feelings" about government plans. Helen Marshall of the Oxfordshire branch of the CPRE told the BBC: "I think most people in Bicester will have slightly mixed feelings. It may bring relief for some of the infrastructure problems and it might be good for the local economy but at the same time they don't want to lose the character of the town as it stands or the fact that it is in a rural setting surrounded by very lovely rural villages - so it's going to be a balance." The garden city planning concept, by Sir Ebenezer Howard, was first used to create Letchworth Garden City at the start of the 20th century and Welwyn Garden City in the 1920s. The concept was adopted again when the New Towns Act resulted in the development of new communities following World War Two. The new communities were created to deal with an accommodation shortage caused by bomb damage, stagnation in the construction industry, returning service personnel and a baby boom. They were called Garden Cities because their layouts included large amounts of green space. Two years ago the government commissioned a report on the possibility of using Garden Cities to help deal with the housing shortage.